-Camper body completely covered with 334 sq ft of ultra thin solar panels. -Sits on top of Dethleff’s Iveco Daily Electric chassis. -Heating system that absorbs daylight heat above 79°F and cabin releases it nightly when temp drops. -Infrared hearing panels in floor walls furniture emulates heat throughout cabin. This series started with the initial thought of a crazy idea of using a Tesla Semi 8 as a base for a RV camper. Once we began accepting that possibility, I moved the conversation over to what manufacturers were either saying they were thinking of making in a smaller scale toward minivan size, but haven’t yet, or decided to make or sell elsewhere other than the US. As I’ve been researching this topic I’ve noticed how you Millennial folks have taken a liking to camping of all types, be it be street van on the street or parking lot camping, minivan vacation camping, or for the young folks with a little more money like their parents and grandparents have with RVs. So I hear you, and as I pay attention to how the EV car market unfolds with the battle of Tesla, Porsche, etc., I promise to keep the other eye open for what’s going on in the e-camper market as well for you. But if you see something I may miss say something! Lately I’ve been scouring the internet trying to find the latest equipment and vehicular platforms that manufacturers and camp coaching companies are lining up to electrify, and to date the choices are far and few in between. It’s all about Spanish Nissan and VW’s “I’ll believe it when they actually make it” Buzz ID EV Camper Bus. So with few options left the next step is to see what might possibly be coming to market hopefully soon while companies test these products in concept or prototype mode. What this article provides, however, is a glimpse of what’s to come down the pike as far as technology with concepts and prototypes manufacturers are using to test to see how soon the technology can be used in camping equipment coming to market soon. One of the biggest problems facing EV campers is once you get to your off grid spot you usually have expensed so much battery power getting there, between highway driving to get to the location, and once at the location, expending power to get to your camping/pitching site if deep into the territory. If you haven’t fast charged enough once you get to your off grid site, and you really should find a place to fast charge before you enter the site location, otherwise you’re screwed (you also should have portable battery packs on hand and in reserve in case of inclement weather or an emergency). But once you’re there a camper begins a delicate dance depending on what it’s equipped with, of having enough power to sustain its base camp during the day, and even more power required to get it and its camp occupants through the night, especially if cooling or heating is required. e.Home is a concept prototype camping vehicle that’s obviously not ready for prime time but I believe extremely close to getting us there with some tweaks and upgrades. In fact if life depended on this vehicle as a matter of national security, I’m sure in a few weeks if they hopped to it, it’d be ready for market. The problem is the manufacturer Dethleff is using an Iveco Daily Delivery truck that has a 107 HP electric motor. Ideally it has a 174 mile range but when you put a camper this mass on top of the frame the range gets hammered way down to only about 100 miles probably less. That’s good only for a bloodmobile. This is screaming for a much larger battery pack, and not as urgent but maybe a larger motor, but it wouldn’t surprise me if they’re having problems trying to find a balance between weight, distribution, and power reserve with a larger pack on an already big rig that sits on a local delivery electric truck chassis. Folks this is harder to figure out than how I describe it so we need to give these folks a break while they figure this out. What I do get about what they’re trying to do here to see the brilliance, is covering the whole rig with ultra thin lightweight solar panels, head to toe, to get the maximum sun and compensate for what the truck can’t give us in power reserve. The 334 square feet of panels generate 3000 watts of power to 228 Ah sodium nickel-chloride batteries. So how much solar absorption this rig gets is crucial. Like it is acquiring real estate in Manhattan, so it is in the wilderness, it’s all about location, location, location. And if you find a camp site spot somewhere that at any point of the day the sun hits this rig, good chance you’ll be set through the night hopefully some juice to spare be damned of a tiny electric motor and power pack. What I like about e.Home is the potential it might have to be a great winter camper if you’re into such a thing. With its phase change heating system it collects heat during the day over 79°F and through an induction system traps it and releases into the cabin at night when the temperature drops. There’s no use of on demand energy as the heat is all stored. And the infrared induction in the floors, walls, and even the furniture makes the heat emulate nicely and evenly throughout the cabin. Ahhhh. Oooo. This is great for desert camping when days and nights are extreme, or mountain terrain winter camping like the Rockies or Andes where during the day with the elevation the closer bright sun gets hot enough to start melting snow, but nightfall makes the cold come back with vengeance. 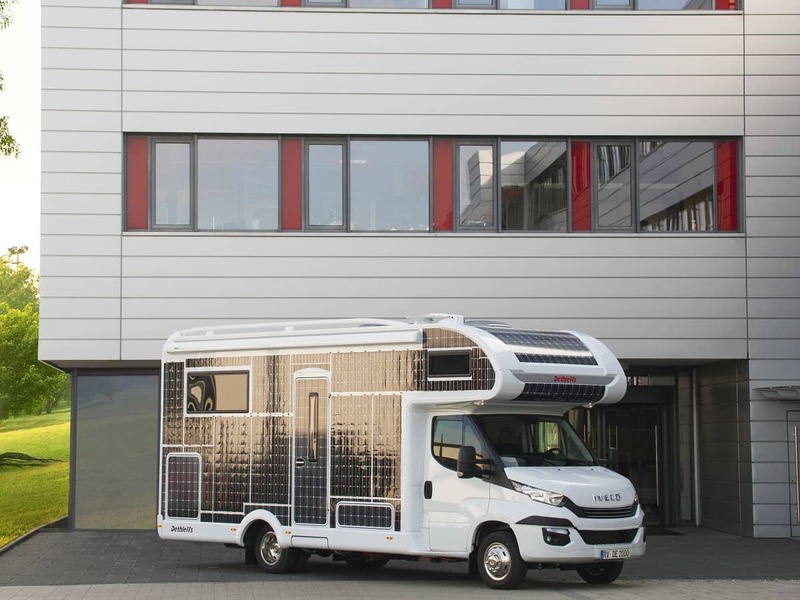 You can also tell e.Home is giving thought to all aspects of the e-camping experience including driving the rig to the locale, and then once there the possibilities of things that could happen. They’re working with the AI group Mobileye, the former Tesla AutoPilot people, and the CampConnect app to smooth out the experience, perhaps make at least the interstate portion of the camping trip driverless. I’ll be the first to admit as a professional CDL A and police pursuit tactical driver I can get lazy behind the wheel, but I dunno about driverless all terrain driving. Hopefully that’s something the 22nd Century can explore after I’m way dead. Nice going e.Home! My complaints are minor to know you’re already working on this stuff. Just keep us up to date with your progress! What do you think of e.Home’s e-camper? Let us know below!